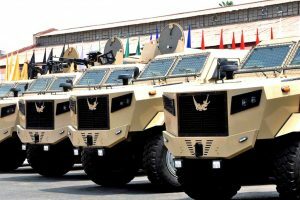 Rubber runflats trialled by the Egyptian Defence Forces on their Crocodile or Timsah 4×4 are on at the centre of the Tyron display on stand 2600 in Hall 2 during EDEX being held in Cairo from 3 to 5 December 2018. The Tyron All Terrain Rubber Runflat (ATR) has been extensively trialled on the Egyptian Timsah or Crocodile 4×4 armoured vehicle. The rubber ATR reduces the logistic burden and enables the vehicle continue with its mission by locking the tyre onto the wheel and by reducing vibration.